Talk about the fourth installment of Yu-Gi-Oh! anime series here. Yu-Gi-Oh! 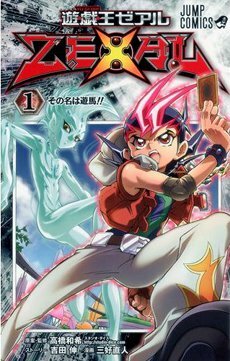 Zexal (遊☆戯☆王ZEXAL（ゼアル） Yū☆Gi☆Ō Zearu?, "Ze-al") is a Japanese manga and anime series and the third main spin-off series of the Yu-Gi-Oh! franchise. The manga began serialization in Shueisha's V-Jump magazine from December 2010 and is licensed in North America by Viz Media. The anime series, produced by Nihon Ad Systems and Studio Gallop, aired on TV Tokyo between April 2011 and September 2012, following the previous anime series, Yu-Gi-Oh! 5D's, with an English-language version airing in North America between October 2011 and August 2013. A second series titled Yu-Gi-Oh! Zexal II (遊☆戯☆王ZEXAL II（ゼアル セカンド） Yū☆Gi☆Ō Zearu Sekando?, "Ze-al Second") aired in Japan between October 2012 and March 2014. The series was succeeded by Yu-Gi-Oh! Arc-V.